I am an addict, of craft books. I never think I have the right one for the project I am working on. I think every book must have some magic information that the others on my shelves do not possess. I bought these 2 last week from Amazon. There are several nice patterns in both and both will be great to browse through looking for projects for my ever growing stash of sock yarn. I realize I am not going to live forever and already have a plethora of patterns that are equally nice. My addiction became even more apparent when I noticed I didn’t have room on my knitting book shelf for these books. So I moved the lace knitting books down to the crochet shelf, after relocating the needlelace books from that shelf to the embroidery book shelf. The sewing book shelf is full too. 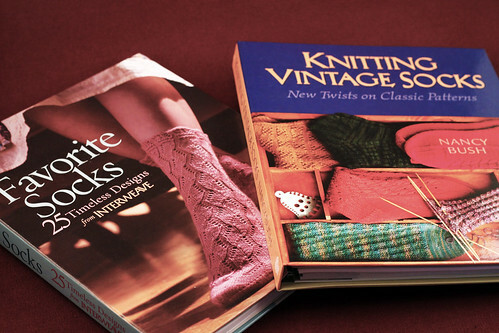 My name is YarnJourney and I am addicted to craft books. This entry was posted on Tuesday, June 16th, 2009 at 3:00 am and is filed under Craft and Knitting. Tagged: Craft, Knitting. You can feed this entry. You can leave a response, or trackback from your own site. I also have too many knitting books. I use ’em like coffee-table art books. Pretty to look at and dream about.